Improve the look of your Harley-Davidson bagger mirrors without sacrificing function. Stylish, high-quality forged and machined black anodized or chrome-finished aluminum mirrors replace dull OEM fairing mirrors. 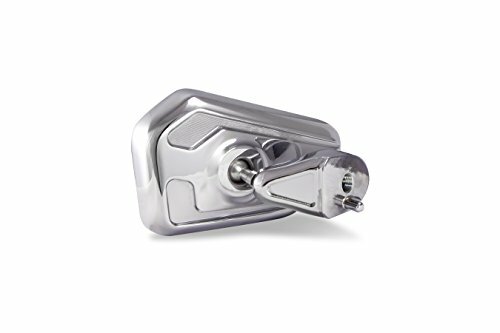 A machined stainless steel ball and nylon socket provide smooth pivoting for easy adjustability and precise, firm positioning. Designed to coordinate with the entire line of Bagger Brothers products for a truly cohesive appearance. Rearview vision is greatly enhanced thanks to the use of DOT-compliant size standards and measure 5" wide x 3-1/8" tall. The Bagger Brothers Elite fairing mounted mirrors are a direct bolt-on replacement for '14-'17 Street Glides, and come with a drill template for installation on '14-'17 Electra Glides and Tri Glides. If you have any questions about this product by Bagger Brothers, contact us by completing and submitting the form below. If you are looking for a specif part number, please include it with your message.